Experience the charm of an authentic tavern house nestled within a quaint village by the sea. 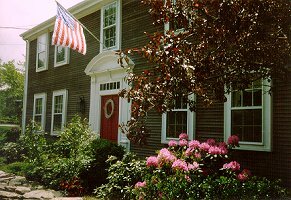 The Crocker Tavern is a meticously restored circa 1754 colonial which once served as a meeting place for the Whigs during the Revolution. Beautiful antiques and reproductions, wood floors, exposed beams, window seats, exquisite woodwork, Oriental rugs and seven fireplaces provide an atmosphere of the colonial elegance of yesteryears. The five romantic rooms have four poster or canopy beds, sitting areas, private baths and air conditioning, and some have working fireplaces. Hearty continental breakfasts are served by candle light with soft music, china and crystal. Village restaurants, shops and harbor are within a short work. Drive just minutes to island ferries and whalewatching cruise.